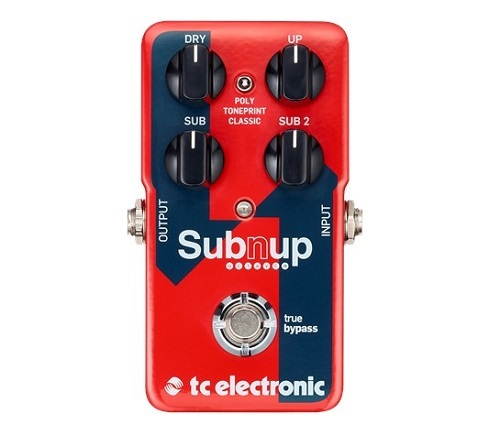 Sub ‘N’ Up Octaver from TC Electronics. Features a superb next generation octave-engine and individual blend controls for dry, octave-up and two sub-octaves, Sub ‘N’ Up is set to deliver flawless octave tones whether you’re playing complex chords or groovy single-note lines. And with the option of adding modulation to the mix via our high-powered TonePrint editor, for spacey ambient octaves, Sub ‘N’ Up Octaver truly is the definition of pitch perfection. Sub ‘N’ Up features the latest in polyphonic pitch technology. This means you get lightning-fast note tracking and impeccable hi-fi octave tones when playing chords. So whether you’re into shimmery octave-up tones for swells, a sweet 12-string ring or down and dirty subsonic octave riffs, Sub ‘N’ Up Octaver will deliver the goods every single time! Sub ‘N’ Up Octaver also gives you access to a cool monophonic octaver. Great for faux bass-lines with a guitar or for replicating the glorious glitchy imperfections of yesteryears octave pedals. Or! !… hook it up to a bass, crank the two sub signals, and get ready to bring down the PA. If the next-generation octave engine puts Sub ‘N’ Up Octaver ahead of the curve, then the TonePrint engine blasts it into outer space. Not only can you beam custom-made tones to the pedal via the free app, you can also make your own octave tone from scratch via the editor. This features our state-of-the-art modulation engine for never heard before octave tones. So go ahead and give that pitch some vibrato. Pitches love vibrato!